It’s not often I like a new dinner recipe enough to make it twice in one month, and then deliberately save leftovers so I can take a picture. Partly this is because I don’t use recipes nearly often enough, and partly because many I do try are pretty good, but not ones I want forever handy in this little recipe book of a blog. Also partly because *sleepy*. But these are worth all the effort because I don’t want a repeat of what happened last time. 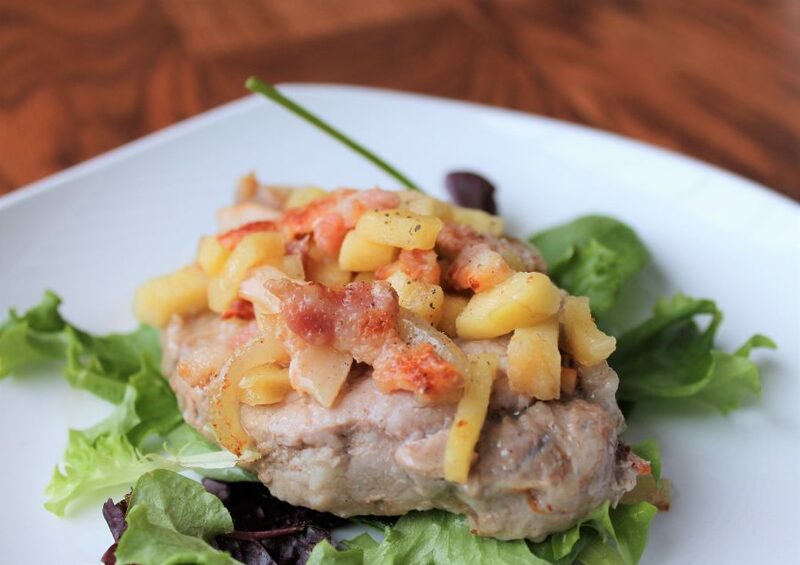 Last time was probably 6 years ago or so, when I made a recipe involving pork chops and apples, where the apples cooked into almost an applesauce, and the whole thing was done in one frying pan, and it was all kinds of delicious. I made it once and never could find the recipe again, but always remembered it being so good. 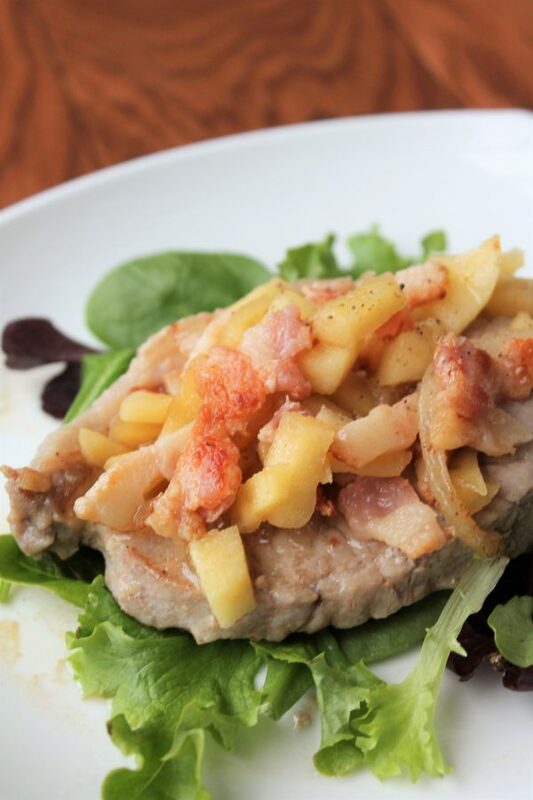 I’ve always loved applesauce on ham and pork chops, so it makes sense that I loved it, but I typically have a habit of drying out pork chops so I didn’t give too much thought to tracking the recipe down again. It requires a bit of hands-on time right before dinner, which I often avoid because Carl is never home at that time and for fear the baby will choose exactly that time to eat and then poop through all his clothes (not an unreasonable fear around here). But a bit of prep early in the day made this super easy to throw together. Chop your onions and mince your garlic and put those in a bowl together. Chop your apple and put it in a bowl. Chop your bacon and put that in a bowl. Cover all these bowls with plastic, put ’em in your fridge, and dinner will come together in no time! Seriously, food prep is saving my life these days. For dinner we ate it with roasted potatoes, sweet potatoes and carrots. The leftover chop was also so good heated the next day and eaten over some mixed salad greens – the apple and bacon that fell off while I ate the pork made perfect salad toppings, and I would absolutely serve it that way for dinner too if all my kids could reliably eat lettuce without choking. A light drizzle of vinaigrette on the greens make it just perfect. You’re gonna love this, and your kitchen is gonna smell amazing. 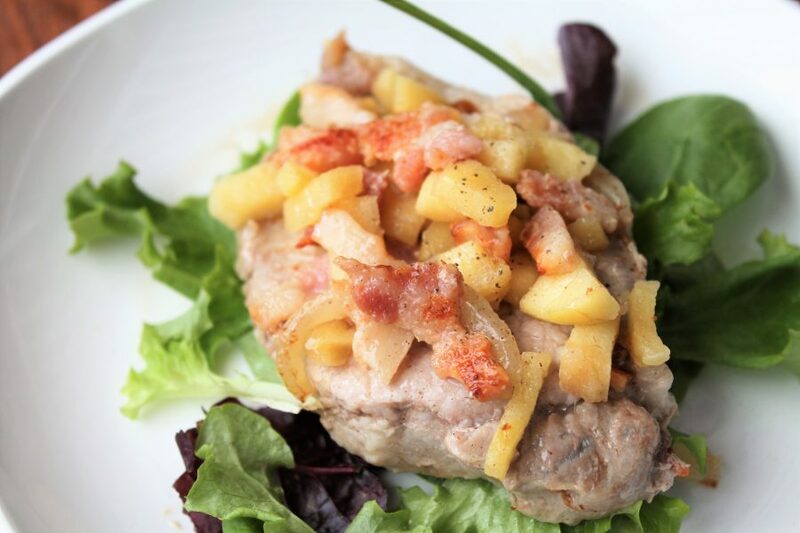 Tender pork chops smothered with bacon, apple and onion make an easy, impressive meal any day of the week. Fry chopped bacon in large skillet. When about half cooked, add chopped onion and garlic. Cook for 5 minutes, or until bacon is fully cooked. Add apple and cook for 1 minute. Remove mixture to paper towel-lined plate, leaving a bit of bacon grease in the pan. 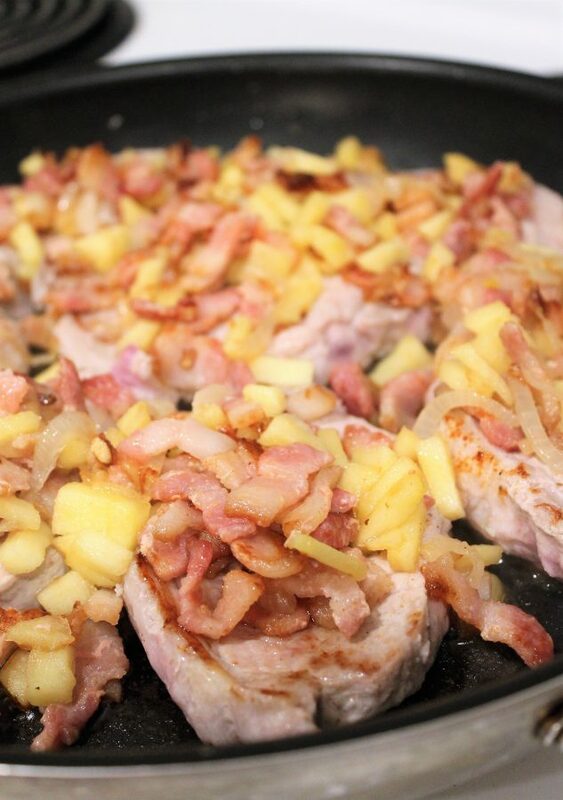 Return pan to heat and place pork chops in the pan. Sprinkle chops with salt and pepper and cook over medium heat for 6 minutes. Use tongs to flip pork chops, then cover them with the bacon mixture and cook another 3-5 minutes, depending on the thickness of your chops. Cover pan with foil and let rest off the heat for 5 minutes before eating. *Adapted from a recipe contributed by Catie Leistra to “Food, Family & Fellowship: Recipes from the Living Word Canadian Reformed Church of Guelph, Ontario”. Doesn’t my sister go to that church? Hmmm, I bet that’s what I’ll be getting as a “sister gift” when I go home in March. The cookbook, not the pork chops! You should put in a request if you don’t get it – I have at least a dozen recipes in it bookmarked to try! Thanks I’m always looking for new pork recipes to try! This is simular to a recipe of Rachel Ray’s that I’ve tried.